We are very impressed with this upper from GFD. After hunting with it and spending a lot of time with it at the range, we feel it is a well-made, innovative product, that performs and functions very well. It is also a complete blast to shoot!! Nice review Eric. If I didn't already have an A17 I'd be super tempted to try one of these. Thanks again for another of your excellent reviews. Which scope did you use and which scope do you recommend? I cannot see the fire selector on the lower. Is there another type of safety on this lower? Sorry guys. I've been dealing with a VERY painful tooth the past couple of weeks, so I've been out of it. Root Canal happens on Friday, so that should take care of things. Thanks! I am giving my A17 to CameraMan Tom for Christmas. I still like it a lot, but this one fits the bill for me as long as I have it. I was using a Bushnell Rimfire Optics 6-18x40mm Side Focus that I got on sale from Amazon for $115.00 ( http://amzn.to/2iXYmCD ). 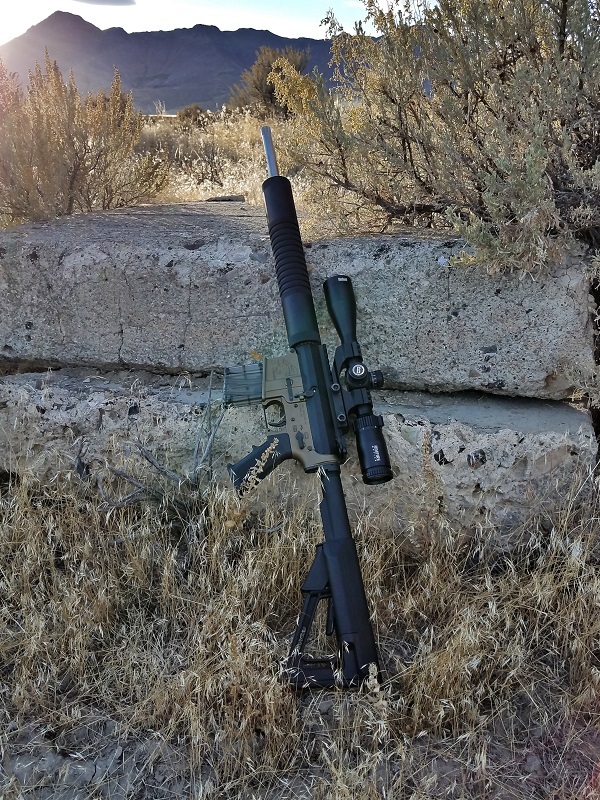 It is a decent scope for the money and it still sits on the rifle today. When I have to give the upper back (unless I buy it), I will put it on one of my other rimfires. No, it is a standard safety. I just realize that all the pictures I used in the article, were from the opposite side from the safety (it is on the left). I hope this helps! If you guys have any other questions, feel free to ask! I bought the upper and yesterday picked up its lower AR-15 counterpart from my FFL (another freaking ten day waiting period, immediately following picking up a Franklin Armory F-17-l VS4 .17 WSM rifle); just installed an scope so hope to try both 17 rifles at the range this coming Saturday. The one thing that still bothers me is that my Garrow upper came missing the knurled threaded cap and am a bit ambivalent shooting it without that protection. Will it be fisseable to install a muzzle break on the Garrow upper? I believe the muzzles is 1/2-28 tpi, but am not sure. By the way...bought two Bushnell scope for both the A17 and Garrow upper; same scope as Eric used on his. If ifs good enough for Eric...definitely is good enough for me as well! Mine came with the thread protector, but you can pick them up cheap online. Odinworks makes decent ones and they are a good price. You can put a muzzlebreak on it, but I doubt you will see any benefit from it. Well, went ahead and bought a Tacticool muzzle brake and just to be sure, a protective cap as well. Are they still around? I called and emailed and have got no response. It has been at least 3 weeks since I let a phone message. I have to say I'm absolutely loving this site. Your range reports, and real world hunting report videos are a blast to watch. And are full of great information.. keep up the good work friend..
Any reviews out there on the Jared .17 wsm uppers?? The thing I don't like/get is $100 plus for magazines. The same with my Franklin. I just bought two magazine for my Springfield 1903 M22 for $240 each but these guns are over 75 years old and were low production items. One of my rifles was from a friend and was bought through NRA for $19.00 including shipping....makes me wish for a "Wayback" machine. I spoke with a rep a few months back and asked him about the magazine price thinking it may be a misprint. He confirmed that was the price for an extra. At least they do provide one if you purchase an upper. I just thought it was high for a 2nd magazine.